There are literally thousands of mobile phone apps popular with young people for communicating with their friends. In recent years, as smartphone technology improved, video messaging has come to the fore.And Vine, an app which allows users to record and share 7-second videos, is, despite being less than 2 years old, one of the most popular. Update: Vine is no longer available. The closest app to Vine is now Tik Tok. Read our explainer here. Vine is an app – owned by Twitter – which can be downloaded free from the Apple app store, the Windows Phone Store or from the Android platform, Google Play. Once downloaded, users can sign in using theirTwitter credentials (or through using their email). The app allows users to record videos of up to seven-seconds. It allows users to edit in a live format through its requirement that users touch their screen to record and release to stop recording. The app also captures sound. 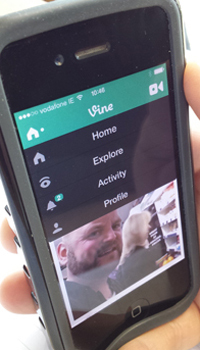 Once recorded, users can share the video they have recorded through the Vine social network or via Twitter or Facebook. It’s worth pointing out that the app has been used by many, including journalists and advertisers, to document real-life situations. Daily, Vine is used to record various different live events, for example, it was used by both protesters and journalists during the Ukrainian uprising Indeed for young people, it allows them to express themselves using modern technology. Indeed, the site has a full listing of its rules listed online, including bans against impersonation, violence, and threats, and inappropriate content. Last year, many social networking websites, such as Vine, were forced to increase their minimum age rules from 12 to 17 as a result of the spreading of inappropriate content. While adult-only content is frequent, once used in a safe manner, it can be avoided. Overall, we think the app is a great tool that young people can use in a safe and original way. Certainly, for those wanting to take the first step in video production, Vine provides free and easy-to-use tools that will enable young people to be creative. And that’s what the internet is all about: giving everyone the space to be themselves in a creative and innovative way.We. Certainly. Like.